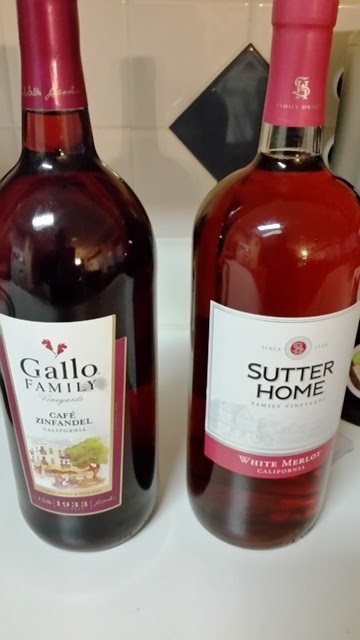 Gallo Family Cafe Zinfandel and Sutter Home White Merlot in the big bottles. Interesting is the Cafe Zinfandel has 9% Alcohol Content and the White Merlot has 11% Alcohol Content. Of the two, the Winos rate the Cafe Zinfandel as Neutral and the White Merlot as Good. First time trying the Cafe Zinfandel; Winos could not agree to buy it again. Winos have tried the White Merlot in the past; agreed then as well as now to buy it again! Yosemite Road Cabernet Sauvignon gets a Good Rating. We liked it last time; we liked it again. Don't let the screw top cap fool you. It's a good wine! 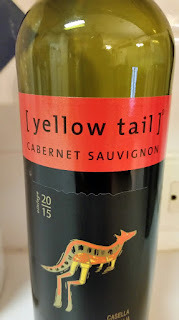 Had this one - Yellowtail Cabernet Sauvignon before, and the Winos continue to agree on purchasing it again in the future. Easily get a Good Rating!